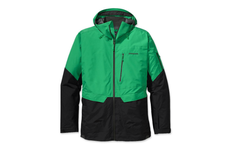 Whether you’re shredding Stowe or Jay Peak, Tahoe or Whistler, your ski jacket is going to have to stand up to constant fluctuations in temperature, wind and sun from the top of the resort to the bottom. In a good jacket, it pays to have versatility. The expectations of everyday skiers and snowboarders are changing. With a large percentage of resorts embracing the hike-to opportunities adjacent to their inbounds terrain, ski jackets are becoming more breathable, windproof and durable. Click here to see this winter’s 10 best ski jackets. There’s an emphasis on jackets with a slightly roomier cut because they tend to pull moisture away and trap more hot air generated by your body on the way down, which can then help keep you warm as you naturally cool off on the lift ride back up. Almost paradoxically, these same jackets are also designed to breathe on the hike up, so you remain warm and dry while skiing down. Armpit vents and breathable, waterproof fabrics like Gore-Tex, eVent and NeoShell assist in mitigating those temp swings. With many skiers wearing packs on a regular basis, many companies are also building chest pockets that double as accessible vents to accommodate a pack’s waist and shoulder straps. As for features, there are removable powder skirts, helmet-compatible hoods, high-wind collars, zipper garages, goggle cloths, audio ports, waterproof and breathable fabrics. These touches appeal to a huge cross section of people who want to dial in their first line of defense against Old Man Winter. But ultimately a quality ski jacket means different things to different people. Because no two people are alike, there is no such thing as the perfect jacket. That said, a lot of these come very close. Click here to see our picks.